With your financial support and commitment, the Alliance for Excellent Education will work to ensure that more students finish high school and that they are prepared for college and career when they graduate. 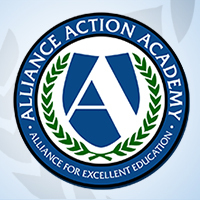 Alliance for Excellent Education’s Action Academy is an online learning community of education advocates. We invite you to create an account, expand your knowledge on the most pressing issues in education, and communicate with others who share your interests in education reform. The Alliance for Excellent Education is constantly working to create better high schools for all students. This page lists the foundations, corporations, and organizations that support our work. By signing up for the Alliance's mailing list, you will receive information on upcoming Alliance webinars, events, and publications. You will also receive a free subscription to Straight A's: Public Education Policy and Progress, the Alliance's biweekly newsletter. Newspapers and websites are filled with the latest statistics portraying what's going on in the nation's schools and classrooms, but numbers can't tell the entire story. In this section, we want you to submit the stories and personal anecdotes that move beyond statistics. Tell us the successes–or struggles–you're facing in your classroom. Tell us how a student or educator has impacted your life. Tell us what you're doing in your community or school to improve the educational opportunities available to students. We'll highlight the most interesting stories we receive so others can read them.